I made few New Year resolutions this time(hope I'll stick to them the whole year), and one of them was to try my skill in Microwave cooking. I have kind of fear when comes to microwave cooking that it won't turn out good. So, to come out this fear, I made this resolution and to help me out, an angel came my way. 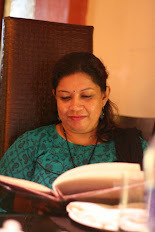 Srivalli of Cooking 4 All Seasons sent me a mail around Dec.'10 asking me if I want to host her MEC event. I said YES immediately thinking this is my golden chance to come out of my fear and give it a try. 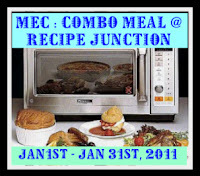 So, during this event and throughout this year, you'll find some Microwave recipes in this blog for sure. So, few days back, I tried this Aloo Matar Paneer in MW and for my surprise, It tasted very well. I tried making cookies, few cakes , Sweet and even a soup in MW before, but it was the first time I was making some sabji(curry). So I was very scared and didn't take step-by-step pictures, but I'll give you exact procedure. So, whoever has the same fear like me, don't hesitate to try, it needs just little more attention while cooking in Microwave but at the same time, it gives you a very less messy kitchen while cooking in microwave. Onion paste : 4 tblsp. Microwave the potato pieces in a MW safe bowl for 5-6 minutes in high(100% power) or until done. Check time to time. It should be just done, not overcooked. In another microwave safe bowl, add oil, onion paste and ginger-garlic paste. Microwave(uncovered) in high(100% power) for about 3-4 minutes. It will soften and change the color to light brown. Take out the bowl and add tomato puree, chilli powder, turmeric, cumin, coriander powder and a pinch of salt. Add 1 tblsp. water in the paste. Mix well and microwave(lightly covered) for about 3 mins. at high or 100% power. Take out the bowl again, stir well and add cooked potatoes, paneer cubes, green peas and sprinkle garam masala. Mix with the spices. Add salt to taste. Add little water to make a thick gravy. Microwave(lightly covered) in medium or 70% power for 3-4 minutes. Your ALOO MATAR PANEER is done. Garnish with fresh coriander leaves. Serve hot with Roti/paratha/naaan or even with any Pulao. kemon accho? Happy New year !! Very nice dish.I like it .and best of luck on your microwave venture for Indian dishes!!! I failed most of the time ha ha . Was in Calcutta, Sunderban and Santiniketan. It was an amazing trip, eating fish and more fish,,,loitering around park street, eating real fuchkas ( and not those phony pani puri, golgappa which have more of sweet and sour tetul chatney than 0f any great taste).. etc etc. I am going to try your recipe on micro soon..
Bhalo theko...tomader sabai ke Naba barsher subhechha ar bhalo basa roilo. Micro wavw diye Aloo Matar recipe ta pore khub icche korche je ei bhabe banai. In this winter such tasty preparations are order of the day. Wonderful recipe of yours. Aloo matar looks so delicious and inviting..will surely try this out. SLurp,thats a delicious dish, would love to have with some rotis,inviting..
Glad to see these microwave recipes, have been eager to try out cooking in the microwave but have never been comfortable. Here are sites that would help you get the most from online healthy recipes and cooking videos you encounter.